Road trip time! 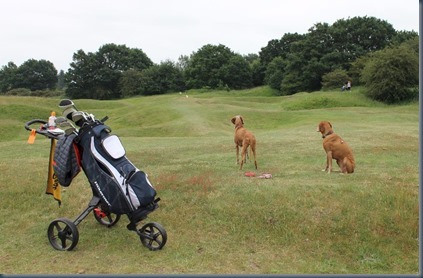 Some friends invited us to a dance event on the Suffolk coast so we thought that we would load up the car with club and pups, and try a few dog golf courses on the east side of the country. First stop, Diss Golf Club. Walk – Unfortunately the road trip didn’t quite stop when we started golfing. The course is surrounded by a number of roads. And they are quite busy so you hear the buzz and rumble of traffic through most of your round. While the course has an off-lead under-control policy, we found ourselves keeping the dogs on a lead for most of the course for fear of them wandering into one of the roads flanking the course. In the front 9, only holes 3 and 6 were significantly far from roads that we felt they could stretch their legs a bit off lead. Wildlife – Lots of rabbits all safely sequestered in the thickets. Most of Rusty and Grace’s off lead time was spent intently sniffing these thorny hedges. 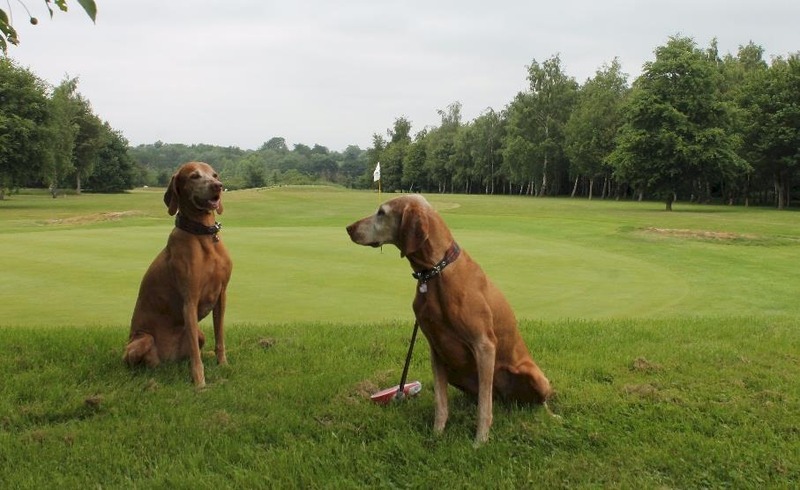 Welcome – A number of other dog walkers did pass by on the course and every golf we encountered seemed delighted to meet Rusty and Grace. Wind Down – Having to rush off to our dance event, we didn’t get a chance to stop by a local watering hole or “doggie pub” so you will just have to check out DoggiePubs.org.uk to find a post play pit-stop. The Hole 9 green is like a giant, earthen, carnival ping-pong toss. The green is in the distance with the flag just poking out from its crater. Even Rust ad Grace seem bemused by this topological curiosity.